This is one of those songs that, while it wasn’t important, does perfectly describe a moment in time. That moment is the mid/late 90’s underground hip hop explosion before it REALLY took off into the rawkus years. Back when most of us would take our cues from Stretch & Bob on a weekly basis. During that time, rappers like Gauge came and went. They had one mildly popular 12” and that was it. Often, they would have the co-sign of a bigger artist (in gauge’s case, it was the cella dwellas). My vinyl collection is full of these kinds of artists. What I love about this is that this was mediocre when it came out. He had his “breathless style” and ran with it. But not many people cared either way cause every rapper there had their own quirky thing they did to attempt to set themselves apart from one another (remember when rappers strived for originality? crazy , right?). The irony of all this is that if he came out now sounding like this, not only would he maybe blow up (assuming he rapped about things other then his cranium) but he’s be accused of biting a “Weird” rapper like Lil’ Wayne cause he’s the only famous person rapping like an alien. Basically what I’m saying is the most half assed underground rapper from that era is only slightly less interesting and original than the strangest rapper out today that gets praised as the best mc alive. It’s too bad, Gauge could have been the next drake had he been born 15 years later. Oh well. 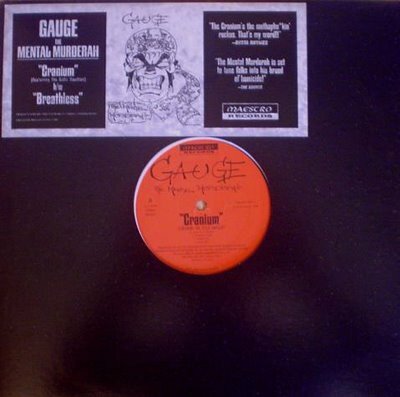 This entry was posted in downloads, Music, song of the day and tagged gauge the mental murderah, hip hop, song of the day by Blockhead. Bookmark the permalink. mmm…works for me. Try again.